There has been a long history of turnpikes and toll roads in the DFW Metroplex; road construction costs assure us that there will be more to come (even controversially). Normally constructed for auto traffic, downtown Dallas once contained the nation’s shortest turnpike… for pedestrians. Located between busy Elm and Pacific Streets, a small parking lot became a popular shortcut for pedestrians walking to downtown destinations. Despite 12 years of “no pedestrian passage” and “customers only” signs, the route was so heavily trafficked that it prevented cars from being parked in the lot. 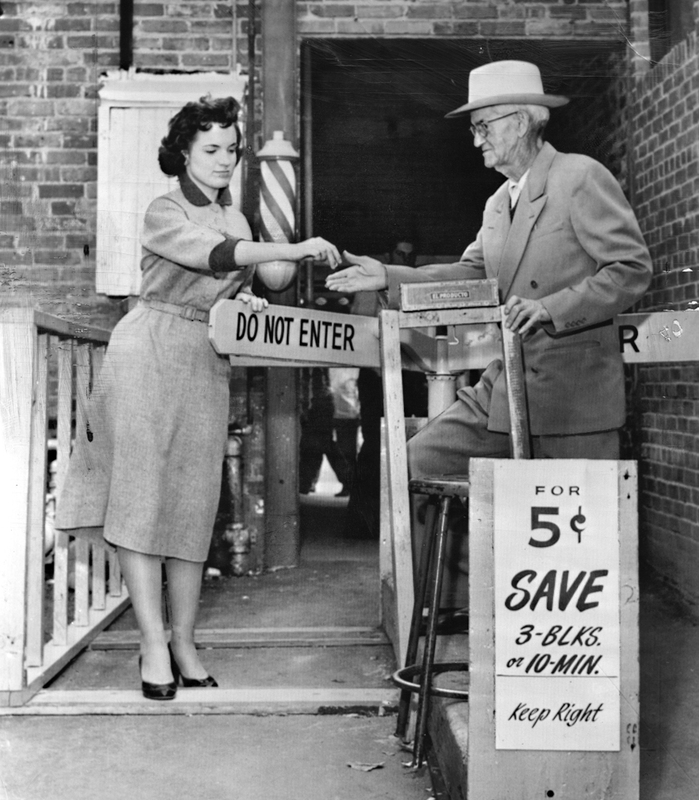 In 1956 owner Elbert Norton had an idea: open a pedestrian-only parkway and charge customers a nickel for each use. Almost 100 people an hour used the walkway on the first day; the short-lived “Norton’s Turnpike” became a unique feature of downtown Dallas on the move. 3 Responses to "A Turnpike for Pedestrians"
This is why it made perfect sense to plan for a future of pedestrian tunnels and skywalks. You raise a good point; downtown congestion was a serious issue during this time period, and planners only envisioned it getting worse. This resulted in a plan that called for the creation of separate levels for transportation modes: pedestrian, vehicle, transit and freight. I think this actually shows why skywalks and tunnels have usually failed! Here the issue was cutting through private property to the neighboring block, not crossing the street. Tunnels and skywalks are normally proposed in order to avoid crossing a street, and they don’t speed that process up unless the street is completely hostile to pedestrians, or if you can ensure that the majority of pedestrians are already either underground or on the second floor. If you’ve got good reason to be on the ground floor, pedestrians will cross the street to avoid the stairs, just as pedestrians here would pay money and cut through a driveway in order to avoid going an extra block out of their way.